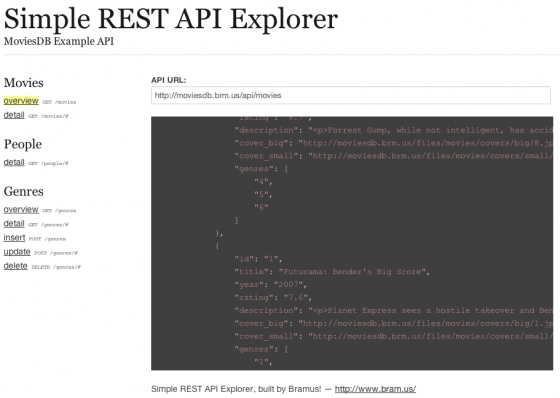 Just pushed a new project to GitHub named Simple REST API Explorer, a simple way to showcasing and exploring all endpoints of your RESTful API. The demo allows you to call some Twitter API endpoints a sample RESTful API I’ve quickly knocked up as the Twitter API is rather unstructured. Update the index.html file to reflect your own API endpoints. All the rest will go automagically. Only tested with APIs returning JSON or JSONP. Custom headers don’t work with JSONP. If you do need both JSONP and an API-Key: ask your API provider to enable CORS so you can switch to JSON.